Joan discovers the illicit drink which she reports to Erica. Joan offers to join in the women's celebrations, for as she points out, "we've been through a lot together". Bea comments that she wishes she'd killed Joan when she had the chance, but Bea reminds her she's speaking to the person who saved her life. Bea spits in Joan's face: Joan merely wipes it away and proposes a toast to eveyone's "future", but insists on taking Lizzie's drink to do it. Having tasted it , she announces that "the party's over" and stubs a cigarette out in the special cake Paddy has just wheeled in on a trolley . Jean hedges when the police demand to know how to contact the "friend" whose credit card she has "borrowed". When she is left alone guarded by a single officer in her room upstairs, she waits until his back is turned then knocks him out and tries to sneak down the stairs, but she is stopped and arrested. Joan reports the illicit grog to Erica who goes to the rec room to tell the women that all privileges are suspended indefinitely. Bea has to control her reaction when Joan makes a point of going to her cell to remove the kettle. Joan overhears the secretary Heather taking a call about the VJ's hearing next day and promises to pass the date on to Bea and Chrissie so they can inform their solicitor. Jean is charged, but once again refuses to be fingerprinted, as she hasn't been convicted. Meg remarks that she can't understand how the women got hold of it: Joan suggests that the obvious person to suspect would be Judy, as she brough the soft drinks bottles in. Judy is puzzled when Erica phones her at the halfway house with a frosty request for Judy to come to see her next day. She takes in a radio for the women, but Meg tells her that they're unlikely to be allowed to have it as they've lost all priveleges. From Judy's obvious surprise, Meg concludes that Judy knew nothing about the booze, so while Judy is being interviewed, Meg goes to the laundry and invites the women to confess to save Judy's parole. 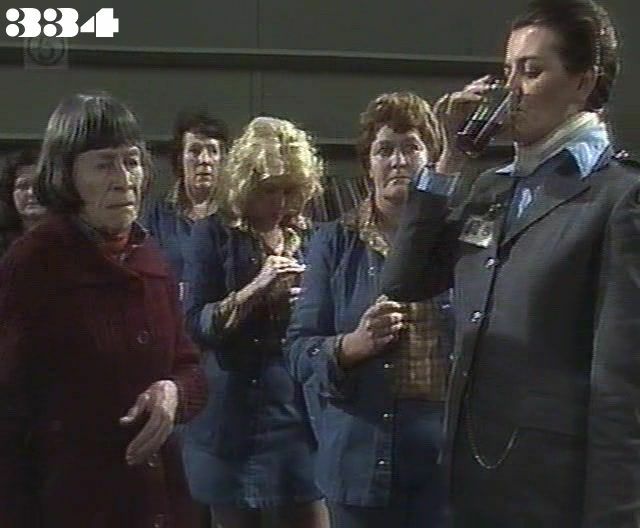 Erica is outraged by Judy's insistence that the bottles must have been tampered with inside the prison, but Lizzie saves the day by owning up to smuggling the booze in. Lizzie loses her priveleges for a month, but is more upset that she was forced to lag on the men from Woodridge. Jean arrives at Wentworth: Joan eyes her suspiciously as if she recognises her , but she's only noted Jean's obvious wig, which she demands is removed and handed over. Colleen complains to Erica that Joan has come back to work too soon and is frankly surprised to see her back at work at all. Erica points out that Colleen was a party to the deal with Bea and Chrissie which effectively rules out any further investigation into Joan's conduct before and during the fire. She adds that it was Colleen who supervised the transfer and allowed the grog in: by comparison Joan has a clean record and is regarded as exemplary by the Department. Joan "remembers" to tell Chrissie and Bea about the VJ's hearing when it is too late for them to phone their solicitor. Meg backs up Joan's claim that they have no right to phone calls even on legal matters, but points out that their solicitor does have the right to be informed of the hearing, even if not by them. Joan claims that she was just about to do that and will phone him at home. The VJ arrives: Meg has called Bea's solicitor anonymously to make sure he turns up. Bea's charge is heard first: her solicitor enters a plea of not guilty, even though Bea has admitted responsibility in a statement to the police. His argument is that Bea acted in self-defence. Meg makes snide remarks to Meg about her concern for the women's welfare and points out that it stops short of helping Bea by giving evidence about Joan. The VJ dismisses the evidence about the diaries, as no-one can corroborate their existence, and there is no independent witness of any misconduct on Joan's part. Meg interrupts the hearing and puts forward her view of Joan's behaviour and attitudes. Consequently, Bea is given an extra two years, but concurrently with her present sentence. Joan challenges Meg with having a strange view of "solidarity", but Meg tells her not to waste time threatening her, and instead to resign before she's kicked out. When Bea's solicitor "signs in", it is clearly into a standard desk appointment diary: it has the month NOVEMBER visible at the top and what look like times in the left hand margin. Note that the ONLY other person who has signed in that day is "Meg Morris". The uncredited uniformed poilceman at the station looks remarkably unmoved in Nola's presence considering she just knocked him unconscious at the halfway house. The flashbacks during Bea's hearing include this brief high angled shot . Does this actually appear during the fight between Bea and Joan?